When is a mystery not a mystery? Obviously, when the mystery isn’t the point. Or the mystery. Yes, that will require some explanation. It’s coming, but there are a few other things to cover first. Abe Aronson and Joanna Delvecchio are old lovers, as in both over fifty and they’ve been together for a long time. Abe is a retired history professor who attempts to brew beer, plays blues harmonica, and is writing a book on John Ball and the peasant’s rebellion. Joanna is a senior (as in ranking) flight attendant who likes to shoot hoops when she’s not worrying about her unhappy daughter, Lilly. Joanna is looking forward to her own retirement, after which she can fly anywhere in the world for free. They are almost but not quite living together in Abe’s home on an island off the coast in the Pacific Northwest. They are, in a word, comfortable with each other. Here’s where we get to the part where the mystery isn’t a mystery. For a moment or two I, as a reader, was congratulating myself for realizing just who—and what—Lioness Lazos really was. Which was entirely beside the point, as I also realized that Beagle had practically told the reader that from the start, and just in case we missed it, he made it even more explicit soon after. It was important that the reader know, in order to understand that Lioness is being hunted, and who her pursuer is, and why it is inevitable that he will find her. All of this was necessary, but preamble. It’s what happens then which turns the story. I don’t think it’s much of a spoiler to state that both Abe and Joanna have been in touch with divinity. That has consequences, for them and everyone around them, and not all of them good. Perhaps not even most, even if you wouldn’t have changed anything. To go into that in any more detail would definitely be a spoiler, because now we’re into the territory of “what the story is actually about,” and that is for the story to tell, so I’ll leave it there. You shouldn’t, though. For those who know, you don’t need me to tell you and you probably read this before I did. 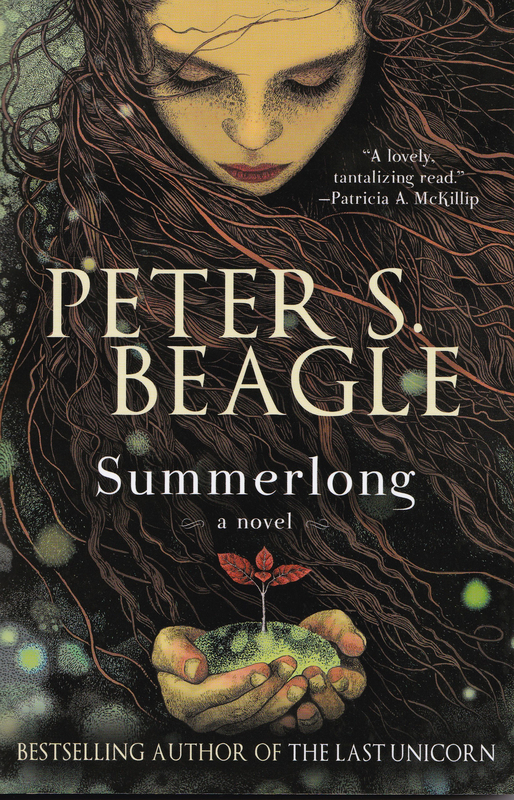 For those who don’t…well, would I recommend starting your reading of Peter Beagle with Summerlong? Yes I would, so long as you don’t end there. I started with The Last Unicorn, A Fine and Private Place, and I See By My Outfit. I’m listing all three because, while The Last Unicorn was first, after that I just went looking for anything else I could find. Regardless, whichever one was first isn’t the point, because my first was just an accident of time. Summerlong can be your first. If you’re the right sort of reader, it won’t be your last. This entry was posted in Reading, Reviews and tagged A Fine and Private Place, I See By My Outfit, Peter S. Beagle, Summerlong, The Last Unicorn by ogresan. Bookmark the permalink.